This is an old article that was posted in 2013 by Al Molloy, on our old website SlideSpin.tv. May it rest in peace. Read Part 1 of this article here! So, now we move from more “factual” evidence of rushedness (completely made up that word) to guesses that we could try to make based on various clues. 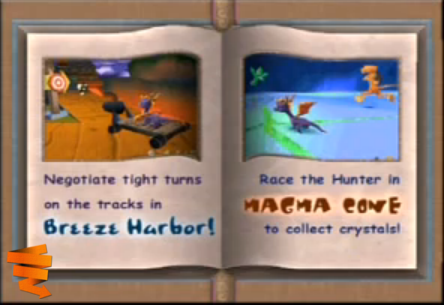 In another demo of Spyro 2, you are provided with a “preview” guidebook showing you various activities which you will be able to do in the game, wherein we curiously see the loveable cheetah Hunter being referred to as “The” Hunter. It may be small, but that definite article appearing before his name is a very interesting entity indeed. Throughout the entirety of the game however, Hunter is simply referred to as Hunter…apart from in Metro Speedway, where the Mayor character repeatedly calls Hunter “The Hunter”. This would suggest that that dialogue was recorded early on and that they didn’t have time to change it, but what’s more interesting is that the voice actor for Moneybags also does the voice for the Mayor, who appears to be very similar to Moneybags himself. Moneybags comes across as something of a crooked politician if you read into the game’s dialogue (thank you to CrystalFissure for emphasising its importance) and analyse the cutscenes. We learn, for example, that it was he who sold weaponry to the Breezebuilders in Zephyr, arguably causing their war with the Landblubbers. Furthermore, in Summer Forest and Autumn Plains, we see that when Moneybags is displaced, it serves as a signal that Ripto has taken over, which would make Moneybags out to be some kind of authority figure…perhaps the Mayor of Avalar? In all honesty, I actually believe that whatever power Moneybags has is more akin to a ceremonial role or even a monarchical one, but what with the Metro Speedway Mayor’s dialogue being dated in terms of the context of the game and he having the same voice actor as Moneybags, it could be suggested that the Mayor was the original prototype for Moneybags. Note: You could also argue that Basil the Explorer in Mystic Marsh was originally just Moneybags, given that Basil bizarrely knows who Spyro is already. In the aforementioned preview guidebook, you are told that you can enter speedways in order to “race for money”. 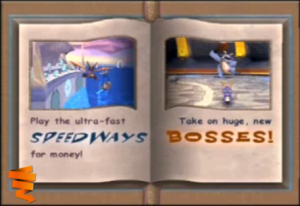 Now, by that, Insomniac may have simply meant that you can get gems, but the wording is a peculiar one and one that would spark more intrigue when you consider Moneybags’ dialogue once you open Icy Speedway, as he wishes you luck in “the races” and states that he is betting on Spyro to win “first place”. When you consider the fact that Spyro 3 had races, it could be argued that the original intention was for the Spyro 2 speedways to contain races as well but for whatever reason they were removed/never implemented in the first place. 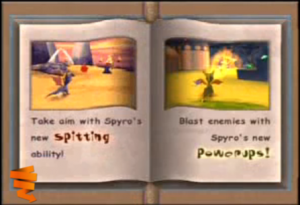 Yet another thing to come out of this preview guidebook is the apparent implication that spitting (as seen in Skelos Badlands, Robotica Farms and others) was going to be an ability that you would be taught as opposed to something that Spyro knows instantly. This is supported by the fact that in said guidebook, spitting appears directly after you are told about swimming and climbing. If the game had had four abilities then that would have fit perfectly with the possible four homeworlds. In Colossus, when speaking to Brother Ned, he says “I think you should kill that yeti” whereas the subtitles in the text box say “I think you should torch that yeti”. It may seem minor, but what it would suggest (as with the Metro Speedway dialogue) is that the voice acting was recorded quite early on and that Insomniac were not in a position where they could get the voice actor for the Brothers to re-record the dialogue in order to suit the “toned down” script. The epilogue which you unlock after completing the game 100% with all skill points reveals an abundance of “extinct Avalar animals” or in other words enemies which were not used for the final version of the game. Their presence would once again suggest that there was even more planned for Spyro 2. 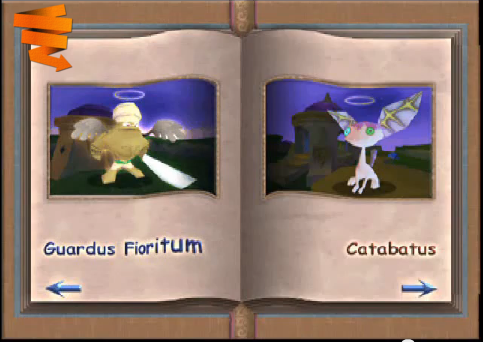 However, it’s more likely that some of the enemies were just beta versions of the ones which eventually took their place in the game (I suspect that “Catabatus” was the original version of the catbats which appear in Skelos Badlands and that “Farmae Robotum” was probably an enemy going to be featured in Metropolis). Finally, we complete the circle and return to the two things which caused all of this hubbub: the talismans suddenly disappearing upon reaching Winter Tundra and there being only three homeworlds despite them being based on the four seasons. Well, is it rather strange isn’t it? The focus of the game switches suddenly to orbs after you’ve been told that the talismans are the most important thing to collect. In all honesty, I’d say this wasn’t exactly a result of being rushed but rather a way to swerve the players and make sure that they weren’t just lolly-gagging their way through the game collecting solely talismans (remember, it’s possible to get to Winter Tundra with just 8 orbs, as they are required to open the second half of Autumn Plains). Arguably, you could say that Insomniac observed the Crash Bandicoot series and how players can ignore the gems entirely and just collect crystals the entire time. The plan was probably for people to then return to the first two worlds and complete all of the side quests which they had previously skipped, then come back to Winter Tundra once they had a substantial amount of orbs (thus lengthening the game out). As far as the homeworlds are concerned, if you look at the level list from the previous article, you’ll notice that there could have easily been a fourth homeworld given the amount of levels that were made, including the required speedway (Icy Speedway) which was just plonked into Autumn Plains. It’s possible that a spring homeworld was planned early on, but then scrapped once Insomniac saw how they wanted the game’s storyline to work. Without the length of Autumn Plains, the swerve after defeating Gulp would have been far easier to spot. Insomniac later accounted for the missing spring homeworld in Spyro 2 when they made Spyro 3: Year of the Dragon, as the first homeworld you encounter is called “Sunrise Spring”. Curiously, that game follows the pattern which Spyro 2 could well have taken in that it has four homeworlds each with four levels and a speedway (not counting the Sparx levels and extra character levels). I no longer think that the game was rushed. I think that, instead, Insomniac simply had great attention to detail, which is what brought about so many changes, even late on in development – even to the point that they released a demo of the game with a level name they later decided to change and gem locations which they decided to swap around entirely as well. So, the odyssey ends here! Thank you very much for reading these articles (and watching my demo videos if you did). I may do a follow up project on Spyro 3, but we shall see how it goes. Special thanks to CrystalFissure and LXShadow. Both were integral to these two articles being produced. Very cool analysis. Looking forward to more speedruns and the trilogy remastered in September. Spyro Reignited Trilogy News: Spyro & Sparx Pop Vinyl Figures Revealed!